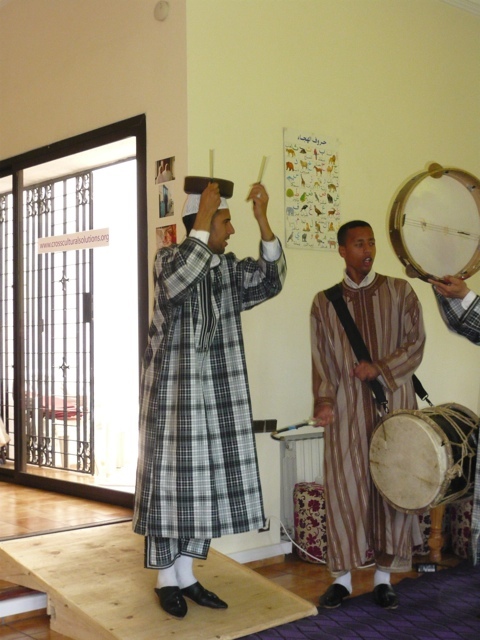 The music we heard today is called “Chaabi” (also known as “shaabi”) which means “popular” or “of the people” in Arabic. 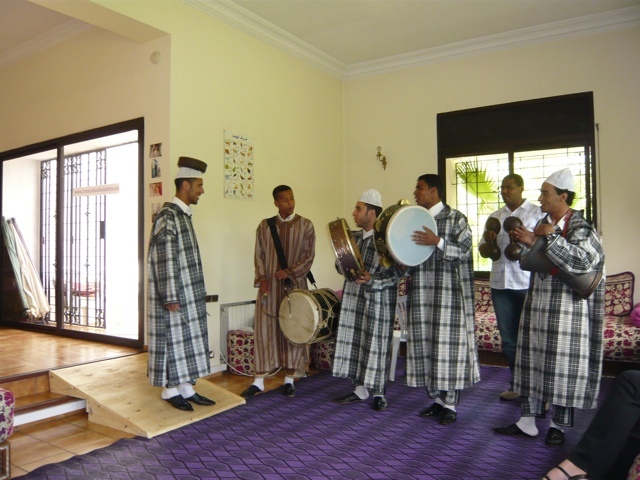 The music is pop music that has Arab, African and Western influences and is generally played at large celebrations and events such as weddings. Here is a fun YouTube Video I found that demonstrates this energetic, rhythmic music. 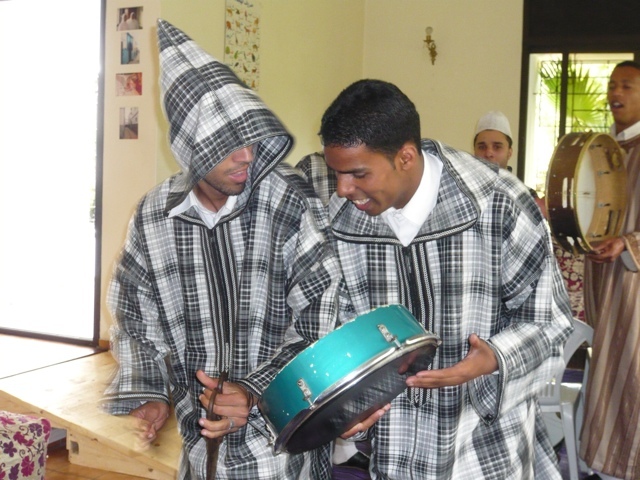 The musicians use a variety of percussion instruments such as the bender which is a goatskin covered wooden drum, the daff which is a wooden-framed drum, covered entirely with stretched goatskin and played on both sides, the garagab which are metal clackers resembling double castanets (one holds two in each hand), the naggarah which are double kettle drums made of pottery, the taarija which is a kind of handheld drum that is either cone or vase shaped and made of pottery or metal. There are also the tan-tan and tbilat, which are kinds of bongo drums. Our visit with the band was absolutely fabulous and fun! 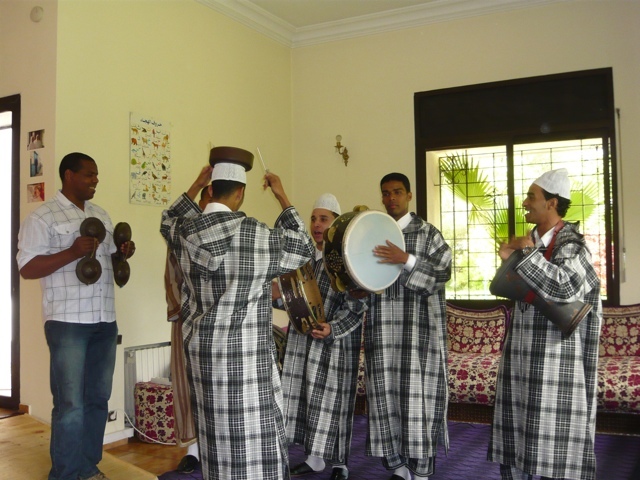 We had just finished our Moroccan cooking class and were hanging out in the large living room when we heard the loud pounding and thumping of the Moroccan band. They had parked their van outside the Home Base and entering playing loud, rhythmic Chaabi music. Instantly we all smiled and the music brought our energy to a new level. 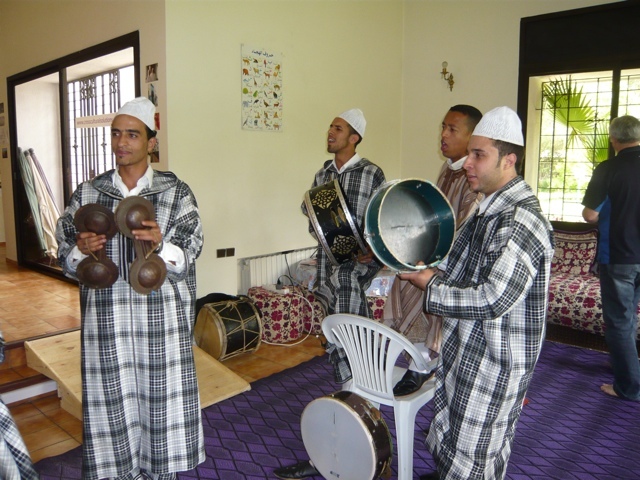 The bank comprised of five musicians all playing different kinds of drum, singing and one playing a variety of percussion instruments such as the “moroccan symbol” which was the axel of a car wheel and he played this by wearing it on his head and pounding it with sticks. Here is the musician playing the car axel on his head! 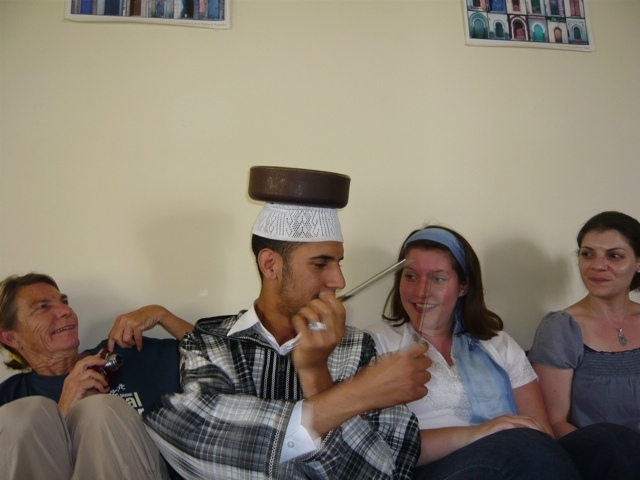 It was very heavy and he joked around a lot by placing it on volunteers heads and playing it.